Columbus Day, Maine. Photo by Gayle Potter. I’m standing on the shore of a lake in Maine, watching my daughter and her best friend canoe a hundred yards to visit the little island they’ve visited dozens of times before. It’s their world, two little girls sitting on a rocky island on a lake in Maine in the autumn stillness. They must have been out there for an hour before I heard a dull engine noise overhead and then a seaplane materialize out of the sky. The plane circled, came down over the pine tree tops and genuflected on the lake surface before nosing up again. It was one of those practice runs that pilots sometimes make on these waters. By the time the plane reached the girls, it was heading back up, fifty feet in the air, and they were already waving at it, like toddlers at a Fourth of July parade. They wave because that’s what little girls do when they see a seaplane land and take off out of the blue, a performance that must clearly be for their benefit. It was the most dramatic interlude of the day, on this Columbus Day weekend. There are few full time residents on the lake and the seasonal cabins, known as “camps” in Maine-speak, are mostly closed up. Docks have been raised. To the northwest, the White Mountains are clouded over. The loons are few and far between, already turning into their gray winter plumage. They make not the wail or the tremolo of summer but the short bark that one hears in the fall staging grounds. One year in December, a neighbor painstakingly counted 236 gathered in the water I’m looking at now. When I finish nailing up the shutters and putting on the chimney cap, among two dozen other chores that face me, our camp will be closed up for good as well. This fall closing is always bittersweet, a rite of the season. The weather can be achingly beautiful, with the bluest skies of the year streaked by cirrus clouds and the last of the red and gold leaves falling onto the water. The sun comes and goes, but when it does come out, everything seems to sparkle. This evening there will be the potluck with brothers and cousins and kids and wives down the lake, the freezers coughing up the last of the hamburgers, the odd Klondike Bar, sauces unthawed and pasta boxes emptied, summer’s bounty come to leftovers. The morning starts with my wife pointing out a beaver the size of small dog swimming in front of the camp, busy after taking down some saplings along a neighbor’s beach and leaving them to float along the shore. The sun rises in the southeast, far to the right of where we normally see it rise. Midsummer it rises directly in front of us, a private experience. A massive boulder not 50 feet from our cabin is called Sunrise Rock, and postcards that go back a century can be found of it. It attracts, even dares people to climb it, some to yell, and others to sit and reflect. Closing up the camp means more than work. It always gives me reason to think about the passage of time, which in my case is best measured by my daughter. It seems like only yesterday she was inside in a high chair throwing peas on the floor on a day like this. The intelligible word of the day was “duck.” Now it’s a giggle fest where American Girl Dolls, Minecraft and C.S. Lewis are strange bedfellows. This morning, I had to make a thorough and convincing check of the canoe for spiders, the bane of my daughter’s Maine existence. The girls travel with two paddles, two life vests, a rock in the bow for ballast and snacks, which no 21st century child can leave home without. But phones stay ashore. No electronics, no Facebook, no Instagram, no texting. Just two kids who’ve beached their canoe, fashioned an anchor with a rock and piece of rope, and are looking for turtles and opened mussel shells. If they want something, they can yell. How 19th century can you get? While my wife puts away bedding and packs up food that would otherwise be fodder for critters, I put on a pair of vintage Tevas and a bathing suit and get into the cold lake water to pull out the pipe that provides water for our cabin. I carry on with my work, crawling into the muddy crawl space under the house to drain the plumbing. One year, I was greeted by a tiny pair of eyes in the dirt, a snake. This year, it’s been too chilly; the snakes have tucked themselves away for the year. I emerge to put away chairs, clean the ashes from the fireplace, and unplug everything. I climb to the roof with a heavy steel cap and cover the chimney for the days when a three foot Nor’easter bears down on the little cabin. The pieces of the dock are already stacked on the beach, awaiting next summer’s screams and splashes. Every so often, I cast an eye across at them, hear their giggles and whoops across the water. My daughter’s is distinct, but also fleeting. This year, two of her cousins flew away to college. Next year, another one heads off. In no time at all, those two will be fledglings. But it’s the image of the plane and the waving girls that stays with me. They wave, the plane goes by, the pines remain dark green and stately even as the water is littered with leaves looking like pieces of stained glass — red and yellow and green — floating on an empty lake. I am busy with chores and she is busy with her best friend on that island, waving at a seaplane and for a brief moment in the scheme of things, being a kid. Enjoyed reading this bit and it brought back some very fond memories. The lake always provides the best memories. Thanks for sharing. WHAT A BEAUTIFUL STORY. LOVE THE PHOTO. Very sweet – a love story to childhood summers. And, yes, Gayle picture is the perfect mood setter. 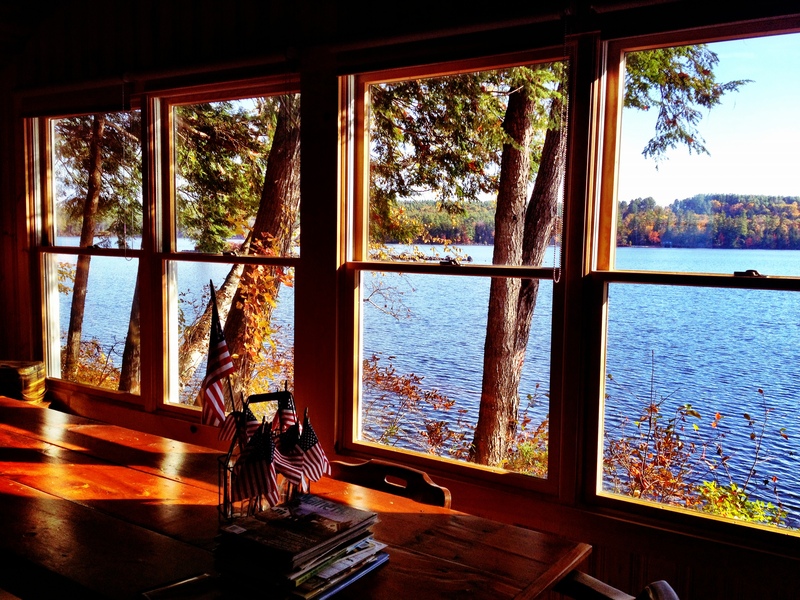 Like summer, childhood is fleeting – but oh so glorious (especially when spent in a cabin on the lake)! Thanks for sharing. What a lovely piece….I am glad you had these moments and wrote them down…thanks for reminding me to stop and take it all in….like a kid! Lovely writing Everett and warm sentiments to go with the cool autumn temperatures. What a lovely essay, I could feel every bit of it. I especially love the “achingly beautiful” weather, what a perfect description. Thank you. Thanks Tami, great to see you in Ireland.